UK Eurosceptics in favour of Brexit will not be persuaded by Juncker’s words in Strasbourg, writes Denis MacShane. The Commission President has simply reinforced British stereotypes of migrant laborers. Denis MacShane was Minister of Europe in the Tony Blair government and author of Brexit: How Britain Will leave Europe (IB Tauris). In an unusual intervention in the European Parliament, Commission President Jean-Claude Juncker appeared to give comfort to the UKIP and Tory Eurosceptic myth that the Poles and other Eastern European citizens who have come to live and work in Britain after 2004 might somehow have been quarantined in their own countries if the Tony Blair government had acted differently. Juncker is mixing up free movement with the right to work but in any case his argument is nonsense. Several hundred thousand Poles were already living in Britain by the year 2000 with more coming in each year as Easyjet and Ryanair opened up several flights a day between British and Polish cities. 230,00 Polish soldiers stayed in Britain after 1945 rather than return to communist tyranny. After 1990, the large Polish communities in England and Scotland became a magnet for younger Poles who came to study and work in the black labour market. Following the Thatcher years, when most regulations covering the labour market were dismantled, it became easy for employers to hire foreign workers at minimal labour costs often from employment agencies who supplied low wage European labour to do unskilled work picking fruit and vegetables, filling sandwiches and above all, working in the building sector. By 2004, the numbers of Eastern Europeans in the unregulated, non-unionised and non-taxpaying labour market in Britain ran to many hundreds of thousands. I was Europe Minister at the time, and we discussed between ministers whether to apply the seven year transition period for labour market entry on offer when new member states join the EU. I argued that it was better to make these workers legal, oblige the Poles and others to pay tax and National Insurance, and allow them to live and work legally in the UK. Every study shows that as a result of this policy the British exchequer has a massive net profit from the tax and social insurance contributions of Poles and other EU citizens. In addition the rent they pay to British landlords as well as their purchasing power in local shops has meant a massive net economic contribution to the UK economy. Had Britain refused to regularise these workers they still would have come but worked in the black labour market as happened in Germany and France. By 2014, ten years after the EU enlargement, Germany had 16.3 million immigrants, one in five of the German population, many of them from East Europe. The number of Romanians living in Spain went up from 208,000 in 2004 to 864,000 in 2010 even if in theory there should have been no labour market access in Spain to Romanians in this period. At the time I represented a South Yorkshire working class constituency in Parliament and was well aware of the hostility to any foreigners arriving locally whether from East Europe, from the former Yugoslavia, or Pakistan. Of course for the fascist British National Party, for UKIP, for anti-EU Conservatives and for the Europhobe press, it was easy to blame the arrival of new European citizens for social problems, or for pressure on housing and schools. The Federation of Poles of Great Britain in 2008 noted a list of 80 hate headlines against Poles published in one paper alone, predictably the Daily Mail. In opposition, the then-Eurosceptic David Cameron and his team attacked the Labour government non-stop for “opening” the UK labour market, even if they knew perfectly well than the right to travel to, and live in Britain meant it would have been impossible to stop the arrival of Poles and other Eastern Europeans. The CBI, British Chamber or Commerce did not join in this Tory attack, as they knew how valuable hard-working often skilled Poles and others were to the UK economy. The campaign against Europeans coming to work in Britain has been at the heart of rightwing Eurosceptic demands that Britain “should regain control of frontiers”, to use the language of London Mayor, Boris Johnson. Sensibly, in this discussions over the package he hopes can defeat his Brexit plebiscite, Mr Cameron did not press this demand to end free circulation of Europeans, and instead asked for some limit of benefits they might be paid. The latest study shows that just 84,000 of the estimated 2 millions EU citizens working in the UK would be affected by the “emergency brake” on a small number of benefits Mr Cameron has now obtained as a safeguard mechanism and which he hopes will persuade voters to defeat Brexit in the referendum. I have long argued that the rest of the EU should be as generous as possible in helping Mr Cameron reverse the 15 years of obsessive Euroscepticism of his own party and persuade first his MPs, then the press and finally voters to defeat the isolation of the UK from Europe. But when Jean-Claude Juncker tells MEPS, “In effect, we will enable the United Kingdom to use the safeguard mechanism to address the consequences of the decision” in 2004 not to keep hundreds of thousands for Europeans working in the black labour market, but instead to regularise them and make them pay taxes, he is actually fuelling one of the dominant Eurosceptic myths in Britain. 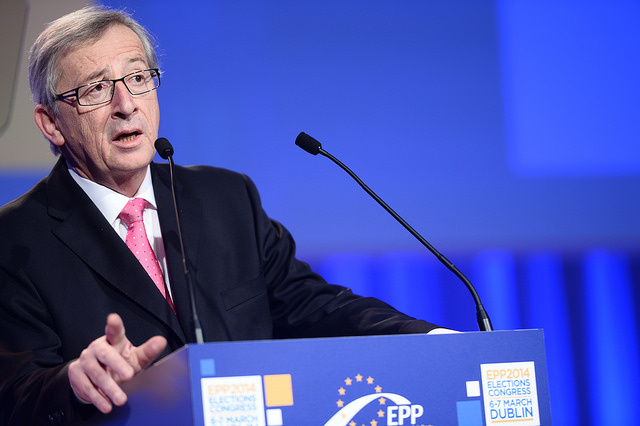 UK Eurosceptics in favour of Brexit will not be persuaded by Juncker’s words in Strasbourg. The Commission President should not have endorsed one of the most potent anti-EU myths, that in 2004 Britain should have tried to prevent other EU citizens from coming to the UK to help grow the economy.